This flashlight is not only a flashlight that can be illuminated, but also a necessary self-defense tool. When walking at night, camping, hiking, and hunting, it can both illuminate and protect the body, ensure personal safety. Designed of waterproof and non-slip, high-tech LED lamps and long service life. Ultra-bright LED bulb with a maximum output brightness of 700 lumens. 3 modes: high, low and flash. It can be widely used in hiking, camping, hiking, hunting, self-defense, etc. 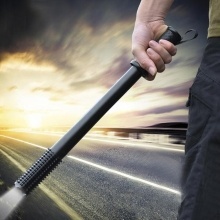 This is a necessary self-defense tool, such as walking at night. Do not light the light directly to the eyes, so as not to cause damage to the eyes. Do not use overvoltage, the voltage should not exceed 4.2V, and do not reverse the battery, otherwise it will burn the circuit board. The charging time is generally 5-8 hours, do not overcharge the battery, so as not to damage the life of the battery.